With the cooler temperatures and shorter days it is easy to see why lawn care takes a back seat to things around the home. However the fertilization of your lawn in the fall is the most important one for helping the grass plants develop a healthy root system. Most fertilizers sold for fall application usually have an analysis number like 30-0-5. 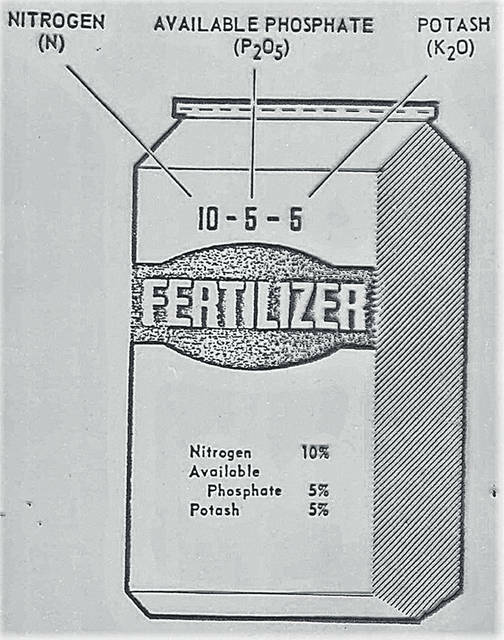 These numbers refer to the percentage by weight of the three ingredients nitrogen (N), phosphorus (P) and potassium (K) in the bag of fertilizer. The remainder of materials in the bag of fertilizer are fillers designed to make application easier and more precise. For example a ten pound bag of fertilizer labeled as 10-10-10 has one pound of each ingredient ( N,P,K,) in the bag. The other seven pounds are fillers and carrier materials for easier application. These materials do not react with the plants or soil. Fertilizer applied in the fall before the ground freezes goes to root development and plant health rather than above ground leaf development. Most fall fertilizers do not contain phosphorus due to the problem of it getting into our streams, lakes and rivers resulting in algae growth. Nitrogen is important for photosynthesis, root and shoot growth. Potassium is important for winter hardiness. Another benefit to a fall or late season fertilization is it will keep your grass greener later into the winter. Fertilizer applied to frozen soil will be prone to water runoff from rainfall or snow melt and will not get into the soil. I saw an article a few months ago dealing with putting new cotton underwear into the soil to help determine soil fertility. I put this idea aside until recently when I saw another reference to this idea. It turns out research in Minnesota backs up this idea to determine the amount of soil bacteria present which will work to break down the cotton in the underwear. The United States Dept. of Agriculture (USDA) is encouraging farmers to try this test as a way of determining soil health and the amount of soil microbes present. The more microbes present the healthier the soil and the soil will have better air and water movement. If after 60 days the new underwear looks the same as when it was placed in the soil you need to look at utilizing cover crops and or minimum tillage. For more information on this study log on to the article titled “Underwear Measures Soil Microbial Activity” found in Farm Journal. Use your Google or other program and type in the article name. One of the common questions I get every year includes “will we have more or fewer insects this year? Insects have evolved over time to survive weather changes and have a good chance to survive wide swings in temperature. People think a cold winter or dry hot summer will result in fewer insects. Insects like the Brown Marmorated Stink Bug become active when the weather warms up and you like me will find a few in the ceiling in the house or on south facing windows. Some insects can slow or speed up their metabolism depending on the temperature thus they can survive changes in the environment. However insects can be injured when the temperature is warm and suddenly turns very cold which may result in the insect’s demise. Also many insects have a built- in antifreeze which keeps them from freezing solid being injured. For more info on this topic log on to: https://bygl.osu.edu/node/1189 and the article titled “Get Ready for a Little Breaking and Entering”>. Other insects may spend part of their life cycle in the egg or pupa stage in bad weather. Some insects like the Monarch Butterfly go south to warmer climates and return north in warmer times. Honey bees keep warm in the hive by fluttering their wings but they need food all winter. Ants and termites can survive by moving to an area below the soil freeze line. Jerry Mahan is a retired OSU Extension Educator Agriculture and Natural Resources for Greene County. He can be reached by email at: mahan.2@att.net.